Sonic can probably take him. 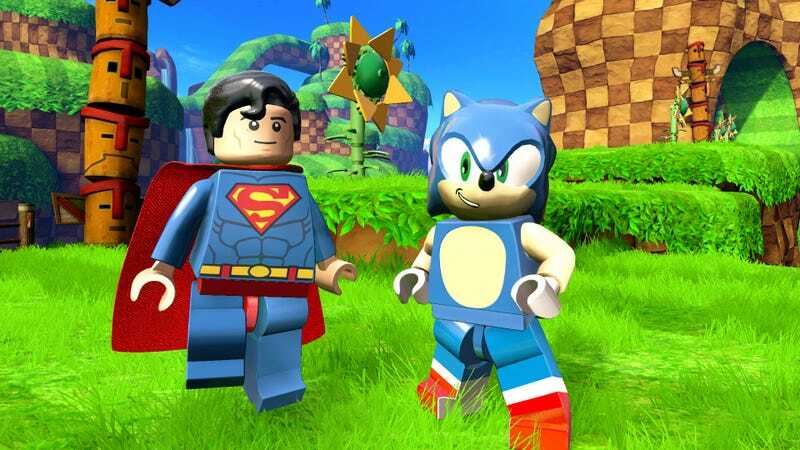 This evening at San Diego Comic-Con, Warner Bros. revealed the six game packs in Lego Dimensions’ seventh wave of content, including a level pack inspired by classic Sonic the Hedgehog, Marceline the Vampire Queen and a new Lego gateway build. While Skylanders continues its yearly releases and Disney Infinity ends, Lego Dimensions continues to build on the excellent base it released in 2015, adding a host of new entertainment properties to its already robust lineup. The second season kicks off in September with the already-announced wave six, featuring a Ghostbusters Story Pack, Adventure Time and Mission Impossible Level Packs, Harry Potter and Adventure Time Team Packs and an A-Team Fun Pack. Wave seven releases on November 18 and includes a new Story Pack, a Level Pack, one dual-minifig Team Pack and two solo Fun Packs. First we have the main event. The Fantastic Beasts and Where to Find Them Story Pack. Like the Ghostbusters Story Pack, the Fantastic Beasts set is basically an entire Lego movie game in a box. Players can build Newt Scamander and his 3-in-1 Niffler creature and run them through the film in six levels. The Story Pack also contains a new Lego gateway build to rest atop the portal that came with the core game, a stylized version of the Magical Congress of the United States of America from the film. Complimenting the Story Pack is a Fun Pack featuring Tina Goldstein and a Swooping Evil. Sonic the Hedgehog, one of the more exciting additions in the season season of properties, shows up in November with a level styled after classic game locations, including Green Hill, Emerald Coast, Labyrinth and more. The Level Pack also includes a pair of vehicles, including Tails’ biplane, just sitting there looking lonely without its creator. Poor biplane. The Gremlins Team Pack stretches the definition of the term “team” pretty far. I guess Gizmo and Billy would have been boring. Gizmo and Phoebe Cates, on the other hand . . .
As with all new properties introduced in Lego Dimensions, Gremlins will unlock an adventure world for players to explore. Not really all that excited about E.T., but then is anyone? I’m sure there’s a fan club out there somewhere that’s totally into the movie, but it’s a strange nostalgia blind spot for me. No blind spots here though. Finn and Jake are joined by Marceline in November. And Marceline is not alone. She’s brought a little friend. We’ll have her axe, E.T.’s finger, Gizmo’s watersports, Sonic’s sass and plenty of Fantastic Beasts and Where to Find Them when Lego Dimensions wave seven arrives on November 18. Best start saving up now, it’s only going to get worse.